Get that confusion sorted. Learn about the two historic dates that bookend Reconciliation Week, and why these dates were chosen. Then follow the questions along to find out what the week is all about, who can get involved and what they can do to participate. 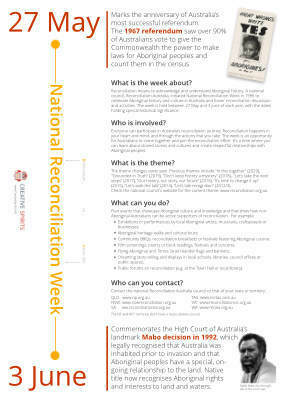 The infographic also lists previous themes as well as clickable links to contact your state or territory's reconciliation council to help you organise your activity or learn more. A great poster to display at your school or workplace, or to use during your reconciliation activity.